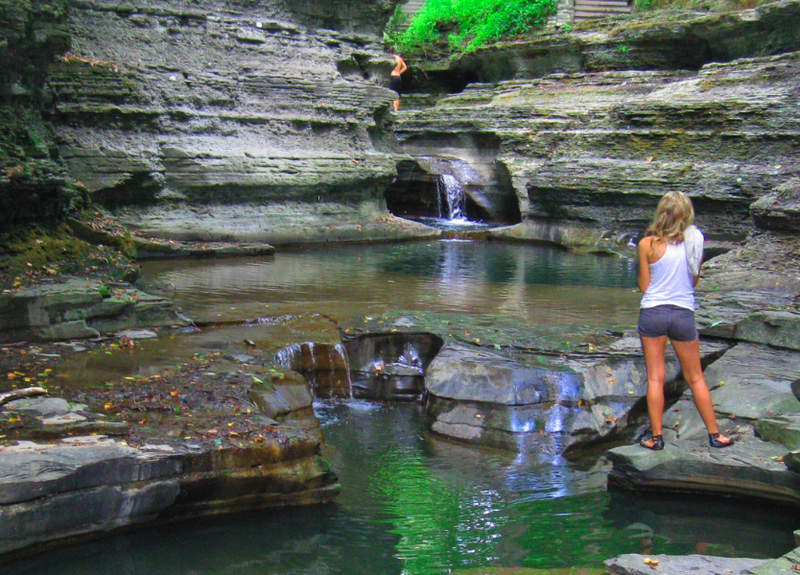 When tourists come to upstate New York and want to see the unique geological wonders carved out by the glaciers, they usually head to well-known Watkins Glen. 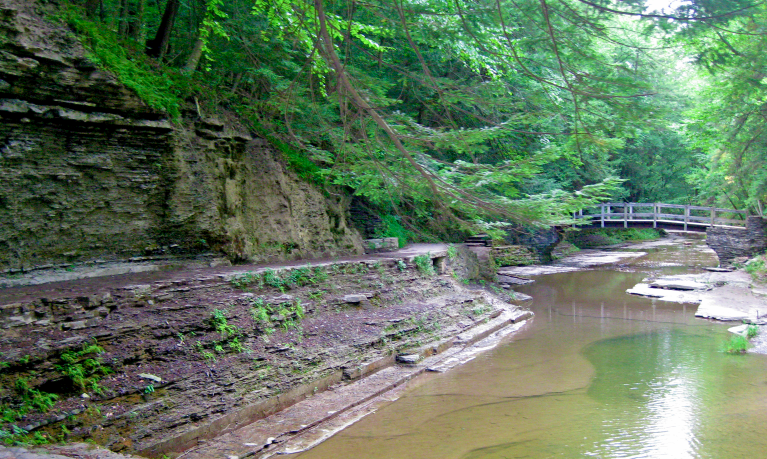 However, there are several other gorgeous gorges — one of them right outside of Ithaca, known as Buttermilk Falls State Park. Ithaca is a super fun destination. Buttermilk Falls has a great campground. For an inexpensive vacation with both great natural wonders and a hip town to explore, this is the perfect combination. Buttermilk Creek is the water source for the series of 9 waterfalls that descend more than 500 feet, creating a narrow channel between steep cliffs with beautiful deep basins of water. 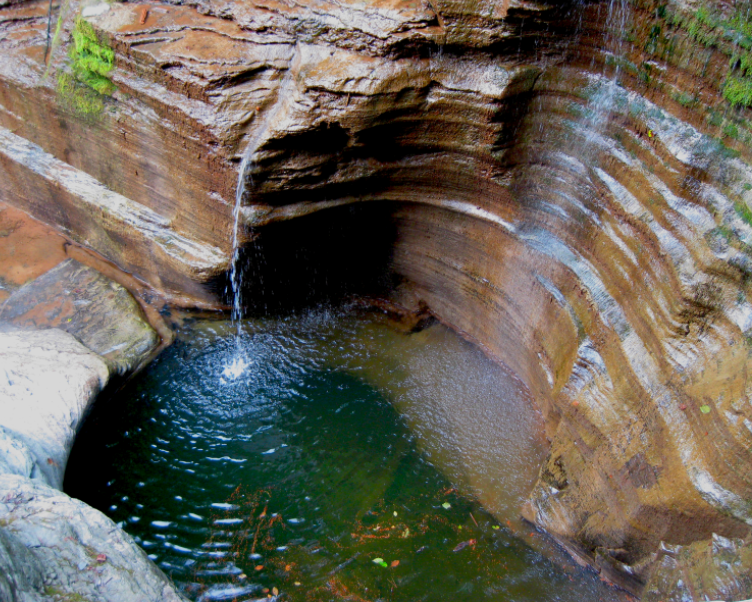 A natural pool at the base of Buttermilk Falls provides swimming with the feel of an old swimming hole. The park is built with lovely stone stairs curving up and through the gorge. The park was donated to the state in 1924 by the Robert and Laura Treman. The Gorge Trail was built by the CCC using natural stone and mortar to create natural-looking paths, bridges and structures. 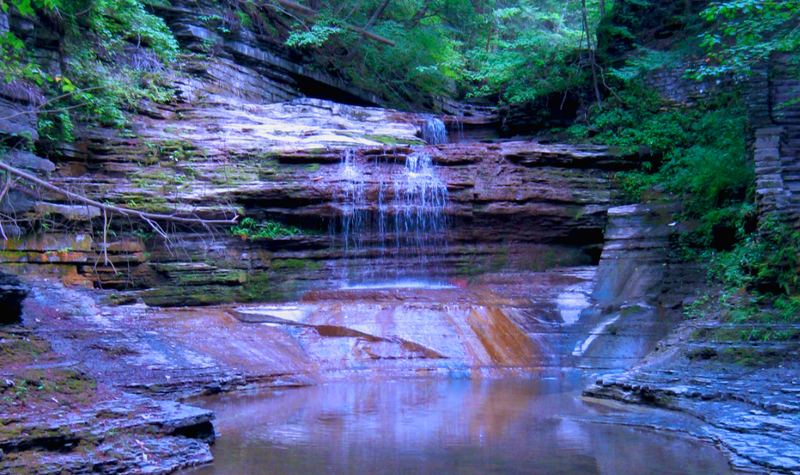 This looks a lot like a perfect swimming hole. It says “no swimming”, but I saw a lot of jumping. You can hike up via two trails. We took the Rim Trail, which is an easy hike with NO scenic views. The best hike in the park is the Gorge Trail which starts by crossing over a bridge next to the swimming area and goes up alongside the first set of falls. The upper park has a small lake, hiking trails through woodlands and along the gorge and rim, picnic areas and playing fields. The lower park has a campground, pool and playing fields. There is a LOT more park. 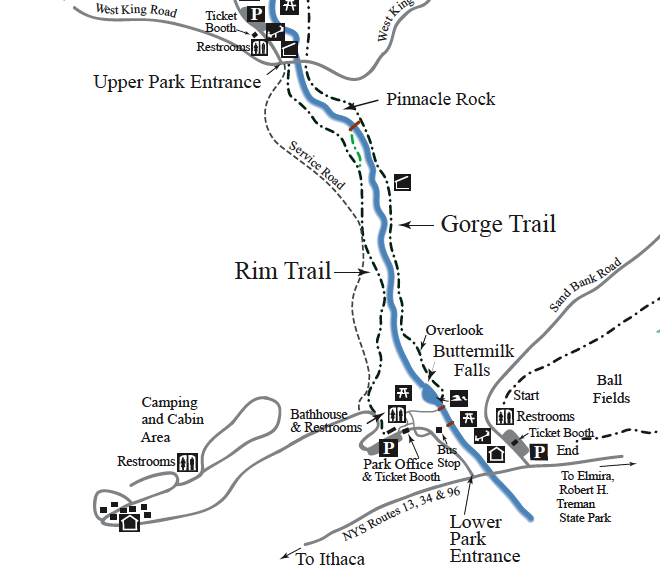 This shows the trails I hiked and the Gorge Trail is most gorgeous. To get to Buttermilk Falls drive south from downtown Ithaca on Route 13. It’s just outside the city limits, and easy to pass by as it is not terribly well-marked from the main road. Entry filed under: Activities, camping, Finger Lakes, Hiking, Ithaca, New York State Parks, Trails, Waterfalls. Tags: finger lakes, Hiking, Ithaca, summer vacation, upstate new york, Waterfalls.